Well, i thought it was a particularly surrealistic combination, but then i googled it, and whaddayou know! Apparently, tons of people are making it, eating it, and even serving it with their Thanksgiving dinners like it's an apple pie! Am i living in culinary dark ages? Here is a recipe from www.epicurious.com; it has 3 forks out of 4, so it must be good. Bring cream to simmer in heavy small saucepan. Remove from heat, stir in curry powder; let stand 2 minutes. Stir in room–temperature mango puree (from 1 mango, pureed until smooth in processor). Meanwhile, stir 7 ounces chocolate in metal bowl over saucepan of simmering water until smooth. Remove from heat. Add 2 ounces chocolate; stir until smooth. Stir in cream. Chill truffle base until firm enough to roll, about 3 hours. Line rimmed baking sheet with waxed paper. Roll 2 teaspoons truffle base between fingertips into ball. Transfer to prepared sheet. Repeat with remaining truffle base. Chill until firm, about 1 hour. Line another rimmed baking sheet with waxed paper. Stir chocolate in metal bowl over saucepan of simmering water just until melted. Remove from heat. Cool slightly. Scoop some of warm (not hot) melted chocolate into palm of hand. 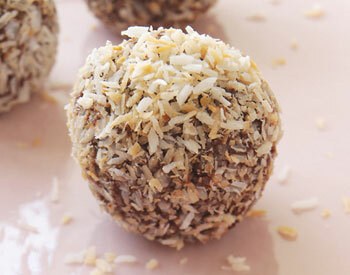 Place 1 chilled truffle in hand and roll in palm to coat. Transfer to prepared sheet. Repeat with remaining melted chocolate and truffles, rewarming chocolate if necessary. Drop each freshly coated truffle (or just–formed, uncoated truffle) into bowl of mango powder or toasted coconut; turn to coat. P.S. Pic is by someone named Scott Peterson, so, dude, don't sue.